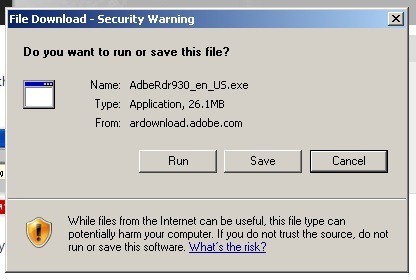 Adobe Reader installs… like herding cats! 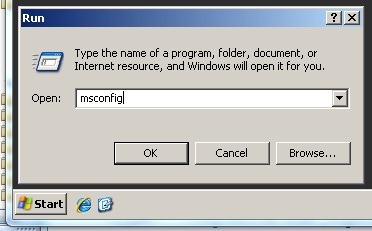 Back “in the day”, the bane of every tech guy (and a lot of end users) was installing anything from Real Networks. The had-to-have-it RealPlayer was known for not only taking a while to install, but also *sneakily* attempting to get you to install a whole lot of other stuff that you didn’t want or need. It was pretty aggravating, to say the least. Thankfully, Real Networks is mostly out of our lives now, but their legacy lives on… thanks to Adobe and their Adobe Reader install process. “But everyone uses Adobe Reader, don’t they?” Well, yeah… that’s true. 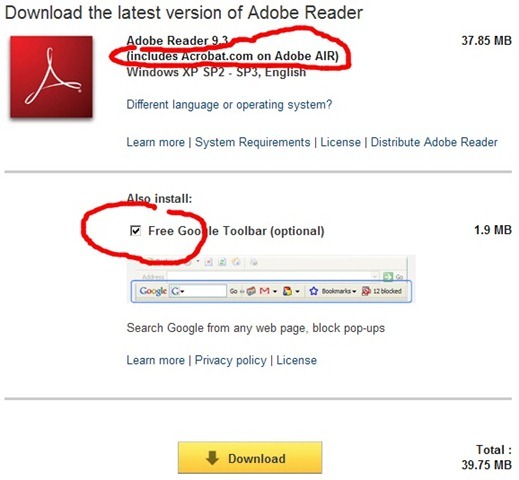 That’s also part of the reason that Adobe thinks they can co-install a bunch of others apps along with Adobe Reader. Although there are some fairly easy workarounds, most folks won’t know about it until after they’ve already walked through the unnecessary Adobe install process, at which point they just leave well enough alone. Let’s take a look at that install sequence, shall we? 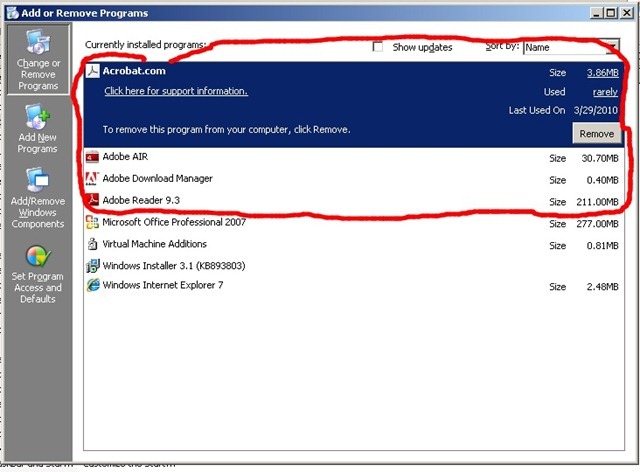 Note the circled areas: Adobe Acrobat.com, Adobe AIR and the Google Toolbar are installed by default, regardless of whether or not you want/need those. Only the Google Toolbar can be unchecked at this point. Hit the “Download” button and proceed along to the next screen. In this case, we are prompted to install an add-on called “Adobe DLM”, which has never been mentioned. 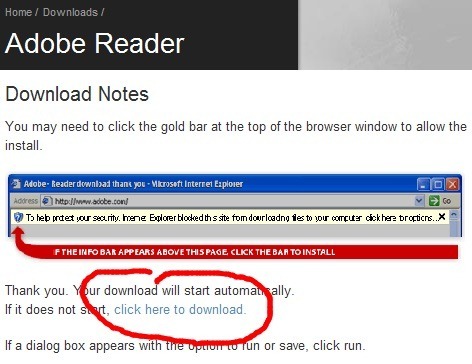 The download instructions (below) encourage you to allow this install and continue. We are prompted once again to install “Adobe DLM”, so we play along… like most people would. Ahhh! 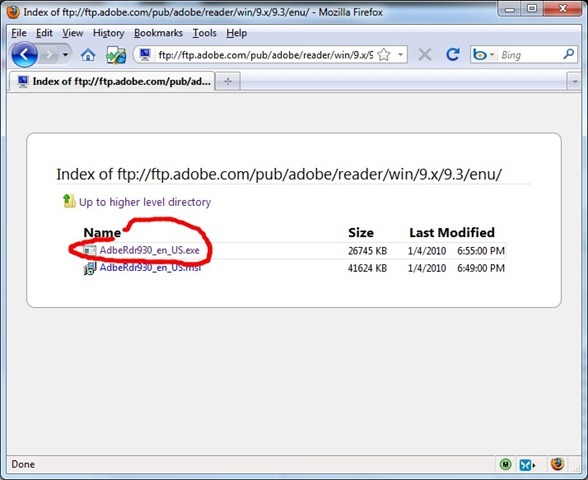 “Adobe DLM” is actually the “Adobe Download Manager”, which evidently I needed to install Adobe Reader. Meanwhile, it proceeds to download Adobe Reader and pester me with other crud that I could install, if I wanted to. Once completed, I have a new folder on my desktop (“Adobe Reader 9 Installer”) and two new shortcuts. Just what I wanted. 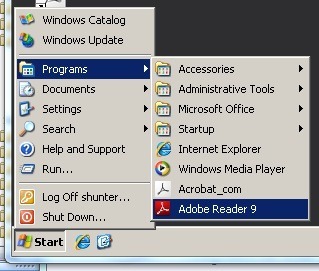 I also have the “Adobe Reader 9” and “Acrobat_com” shortcuts in my Start Menu. Thanks, Adobe… more clutter! 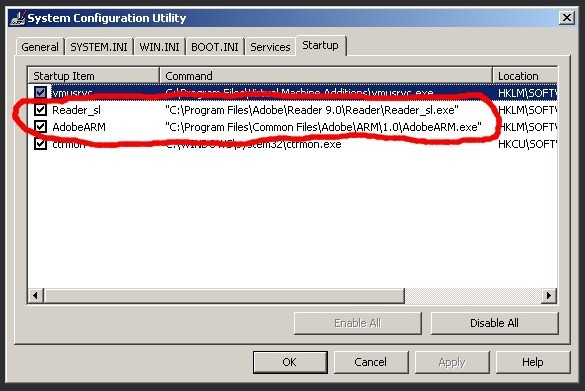 Opening MSCONFIG (great for disabling unnecessary Startup programs… but use it wisely), I find two items that are now configured to start up automatically with my computer: “Reader_sl.exe” (Reader Speed Launcher) and “AdobeARM.exe” (Adobe Reader Manager). Finally, I now have (4) new options in my Add/Remove Programs dialog. Somehow my initial 37.85mb install has swelled to 245.96mb. Certainly makes my day! Hit the “Download” button to continue. Forget about the “AdobeDLM” requests. Cancel those altogether. Instead, click on the “click here to download” link just below the instructions. 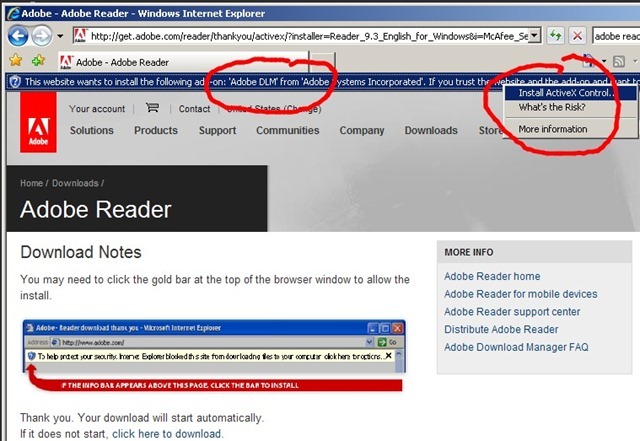 Let the install finish and enjoy your slimmer and trimmer Adobe Reader install. 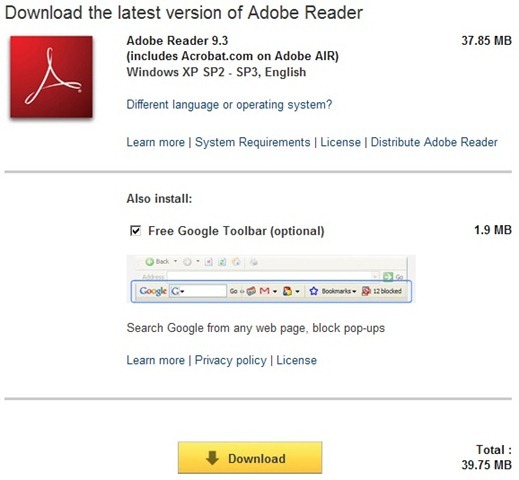 Sadly, the full install of Adobe Reader is still about 211mb, which is quite large. If you prefer to use a PDF reader with a smaller footprint, I recommend the free & fast Foxit Reader, which weighs in at under 10mb. 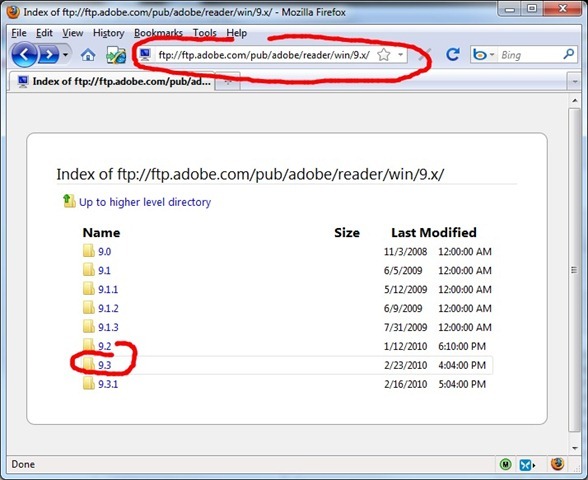 For advanced PDF features, you may still need Adobe Reader, but for 99% of the PDFs out there, Foxit Reader works just fine.